Lifting weights is great for building muscles, but it’s really only 1/3 of the task – and you won’t build much muscle from lifting weights if you don’t cover the other two areas too. Just as important are your nutrition and getting sufficient rest between workouts. 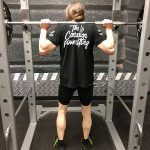 Ask even the newest weightlifter and they can probably tell you all about lifting weights, what reps & sets mix to use and what every piece of equipment in the gym is for – but very few can give you informed information about nutrition and what they should be eating to grow those big muscles they’re so fervently working towards. In the 1960’s and 1970’s bodybuilders would eat a healthy, nutritious diet in preparation for, and during, their contest season and then ‘bulk up’ during the off-season. The idea was to ensure you ate as much as you could, regardless of the quality of food, in the hope that their body would have all the nutrients it needed at any given time to build maximum muscle. So they would put on 30 – 50 pounds of bodyweight, only to then diet off the extra 20 – 40 pounds of fat included in their extra mass. 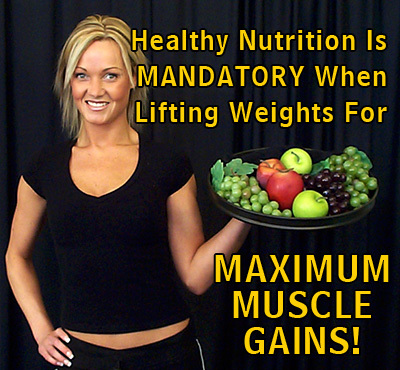 Proper Nutrition For Lifting Weights Is Mandatory For Maximum Muscle Mass! Nowadays, though, it’s understood that one can build maximum muscle mass while staying fairly lean, with little extra bodyfat to burn off at competition time. No longer do they consume massive amounts of pasta and white potatoes, but instead they’ve reduced their carbohydrate intake, upped their protein intake and replaced the simple carbohydrates they were eating with complex carbs like steel-cut oats, sweet potatoes (yams), brown rice, etc. 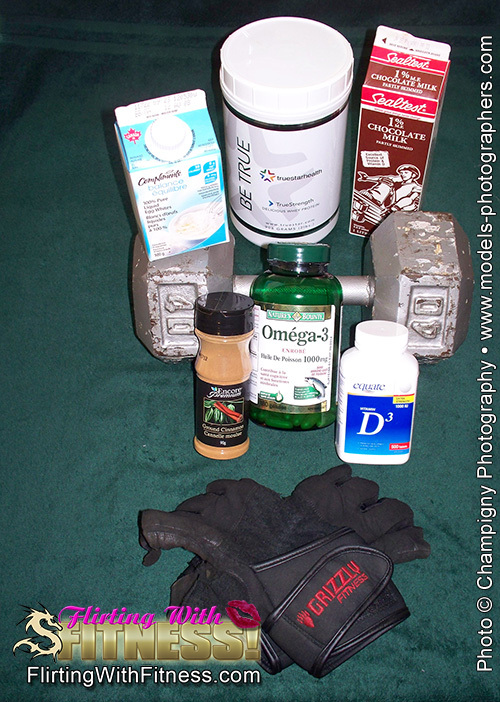 So what should your nutrition look like for lifting weights? First you need to know the total number of calories you’ll need, and that varies from person to person, even if you’re lifting weights together. The calories you need are based on your metabolism more than your gym sessions, so start with what you’re currently eating – after all, your current caloric intake got you to your current weight and is maintaining it, right? Start by dropping soda and alcohol from your routine and replace those calories with protein sources. Carbs and protein each contain 4 calories per gram, so it’s a straight swap. Replace your remaining simple carbs with complex carbs – most of your carbohydrates should come from sources like the steel-cut oats, brown rice and yams mentioned above plus vegetables like broccoli, cauliflower, tomatoes and apples. Do not try to lower your intake of fats, just make sure they come from healthy choices like fish oil, krill oil, eggs and nuts. It’s especially important to make sure you’re getting enough Omega-3 and Omega-6 from your fats, on a ratio of 2:1 or 3:1 – getting your fats from the sources mentioned will go a long way towards meeting those goals, but you might want to consider an Omega-3 supplement as well. At this point you’re getting your carbs and fats from healthy sources, and that just leaves your protein. 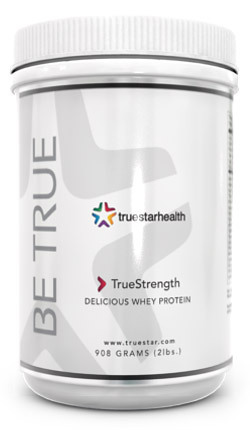 The are a great number of protein sources readily available. Some of the best are milk, eggs (especially egg whites), salmon, tuna & other fish, chicken, lean red meat, etc. Fortunately there is enough variety that you can easily vary your diet to keep it interesting while staying compliant with good nutrition practices. You won’t need to count calories and be very vigilant for long – repetition week after week will make eating this way a habit before long and you’ll be able to maintain your eating habits automatically then. But make sure you DO stick to your new eating patterns long enough for it to become habit before you ease up at all. From that point on, your nutrition for lifting weights depends on your personal goals. If you want to maintain lean muscle mass while burning off bodyfat, lower your daily carb intake by 10%. If you want to build more lean muscle, up your daily protein intake by 10%. In either case, note the effect it has and adjust your levels accordingly. Continue adjusting your nutrition as you go along, keeping the changes small and noting the effects. Healthy nutrition for lifting weights really is that simple, so there’s no reason to let poor nutritional habits sabotage your efforts in the gym! Effective Nutrition – Are You Getting Enough Protein To Go With Your Workouts? Are Fat-Free Foods Making You Fatter? Weightlifting Nutrition – 5 Ways To Power Up Your Post-Workout Shake Which Protein Is Best For Weightlifters And Bodybuilders? This entry was posted in Healthy Nutrition and tagged build muscle, diet, healthy nutrition, lean muscle, lifting weights, muscles, nutrition, nutrition for lifting weights. Bookmark the permalink. As always, great article! I was also a believer of the “bulk and cut” approach, but then I realized that it just doesn’t worth to gain that extra fat and then cut it down. It’s better to gain just lean muscle instead. Craig W. recently posted..Do You Make These 12 Weight Loss Mistakes? If only we’d known, eh Craig? Would have saved a LOT of energy spent on cardio for more explosive workouts!